…the mice will play. Or in this case, when Mrs. G is outta town, I often get bored and have to find ways to entertain myself. There’s only so many movies I can watch that she won’t watch (ie Sci-fi, comic book based movies like Wolverine or nerdy moveis). 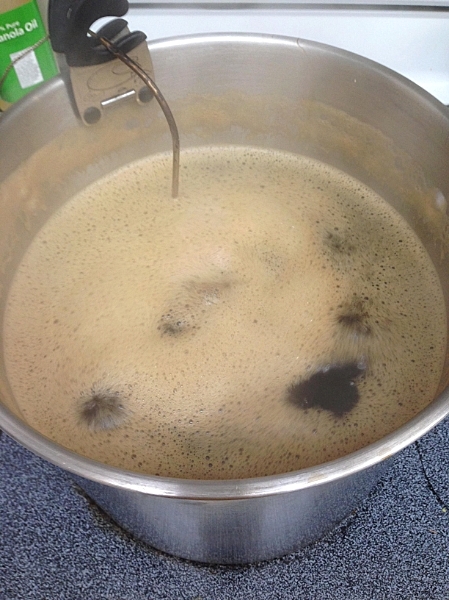 One way I’ve found to entertain myself is to brew beer. I’m no expert at this, it’s only my third batch, but it has been fun so far. Being an amateur, I haven’t graduated up to brewing with malted grain or all-grain. Like I said, this is only my third batch, so I’m keeping it simple and using the canned hopped malt concentrate. You have to start somewhere, right? This is the one I chose for this batch. 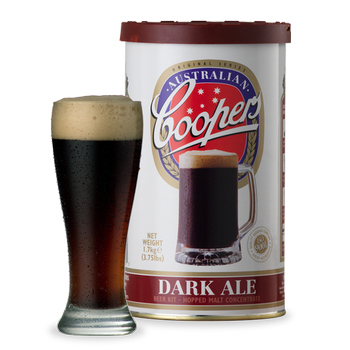 Cooper’s Dark Ale. We’ll see how it turns out in a month or so. 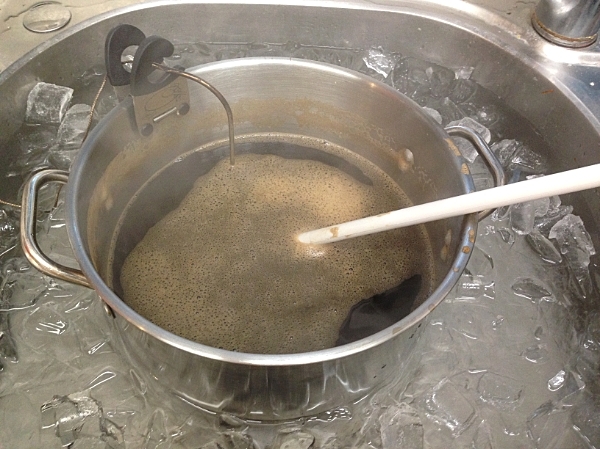 Chilling the wort in a sink full of ice water. I didn’t get anymore pictures of the whole process as its kind of hands on and honestly I wasn’t thinking about it. I will report that I checked on it this morning and the yeasties are doing their job, eating the sugars and producing carbon dioxide, which you can tell by checking to see if your airlock is bubbling. I’ll keep you posted on some other steps down the road and how it ends up turning out. 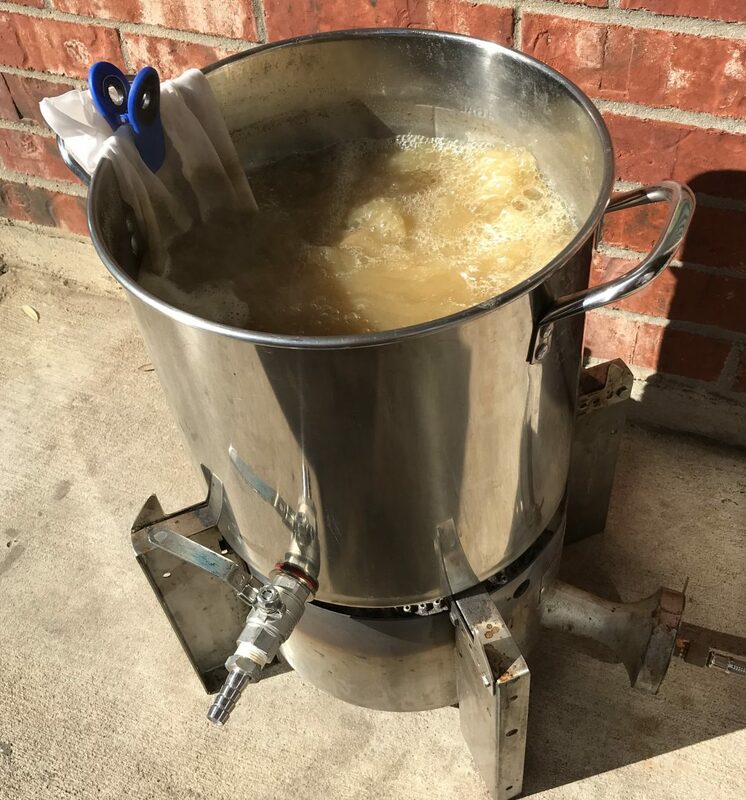 I will say that if you like to cook (especially if you like baking and using precise measurements, temperatures and yeast) and you like beer, than you will enjoy making your own beer. Yeah, it’s a labor of love and takes a lot of time and patience (mostly waiting for the next step which could be weeks down the road), but when you hand somebody a cold one, they take a sip and say “That’s really good. You made that?” it will bring a smile to you face and it makes it all worthwhile. Lol. We all have to have our hobbies. This is one I’ve just started dipping my toes into. I think the hardest part is making sure everything is sanitized very well (try that with two dogs in house) and having the patience to wait. And wait. And wait until it is finally ready. Wow! You learned me something new, Richard. We’ve recently had quite a few new breweries open up in Dallas. Been meaning to go tour some of them. Maybe they’ll let me have a slant. Thanks for the heads up. What is it about guys and cooking that tends to naturally lead to brewing? I’ve been fighting the urge to try brewing for about a year now, I find my fight growing weaker with each passing day.